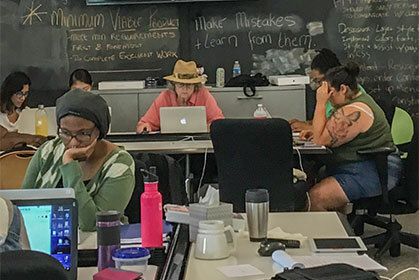 Codetalk is an intensive 16-week digital web technology vocational program for low-income, underserved women of all age groups. We teach the fundamentals of front end web development – how to code and build websites. We prepare our students through a comprehensive curriculum for the rigors of a technology career in tandem with development professional and soft skills, while addressing personal and circumstantial barriers through case management and supportive services. Our Culinary Training Program is a vocational initiative that educates low-income adults in kitchen safety, culinary techniques, and professional and life skills to help them obtain jobs in the food service industry. Classical cooking techniques are taught through 8 weeks of hands-on classes lead by experienced local chefs, followed by a 4-week internship placement at a local restaurant. The Early Learning Center (ELC) is an enriched, all-day childcare program that provides children 18 months to 5 years old the opportunity to learn, grow, and become independent learners in a nurturing and socioeconomically diverse environment. St. Joseph Center’s Employment Development program assists people who are accessing our array of programs to obtain employment in a range of job fields. Employment Specialists help clients create employment plans while also building relationships with employers throughout LA County to identify open positions that match our clients’ skills and expertise.